This week we mark the 100th anniversary of the US entry into The Great War, or what we’ve come to know as World War I. The US declaration of war in April 1917 marked a decisive turning point in American history, as for the first time the US engaged in a European war. This decision marked a decisive break with the nation’s longstanding tradition of isolationism when it came to European affairs. But at the outset of the war in 1914, that spirit of isolationism was running high in the US. Reflecting this view, President Woodrow Wilson announced that the US would remain neutral. But over the course of the next three years, many events transpired that gradually moved a majority of Americans to accept US involvement in WWI as inevitable. To help us understand this crucial period in US history from 1914-1917, this episode has two segments. 1) First, I provide a brief overview of the isolationist tradition in US history and how it changed by 1917. To illustrate this transition, I look at two hit songs from the period. In 1915, the top song in the US was explicitly anti-war: “I Didn’t Raise My Boy to be A Soldier.” But two years later, the #1 song in the US was “Over There!,” a rousing patriotic ditty extolling America’s commitment to military victory in WWI penned by the famed songwriter George M. Cohan. 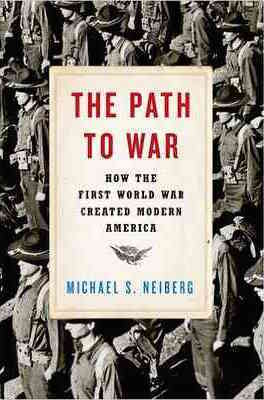 2) Second, I talk to historian Michael S. Neiberg about his new book, The Path to War: How the First World War Created Modern America. It’s a close examination of the years between 1914 – when WW1 began in Europe – and 1917, when the US finally chose to enter the conflict. It’s a fascinating and largely forgotten period in American history.